A state of perplexity or uncertainty over what to do in a difficult situation. While some terms may be easy to define, the post-acute care industry is finding it nearly impossible to define the different types of readmission rates for which they are being held accountable. And since we are “all in this together,” it requires that all post-acute care providers must understand readmission rates and how they impact reimbursement in order to be a worthy network partner. 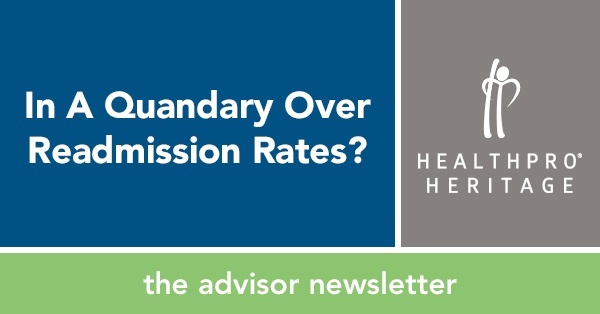 Subject-matter experts at HealthPRO®/Heritage offer the following guidance to help make sense of the “Alphabet Soup” of readmission rates. Medicare will be withholding 2% of FY 2019 FFS payments to fund the performance incentives. To encourage SNF providers and their downstream partners to reduce hospital readmissions in an effort to reduce costs and improve the quality of care. All levels of the care continuum. Since skilled nursing facilities must now evaluate and strategically choose downstream partners, it is imperative for home health agencies, durable medical equipment (DME) suppliers, as well as assisted living and independent living communities to understand the SNF VBP. Moving forward, savvy providers at all levels of care will be expected to demonstrate effective readmission mitigation strategies to earn collaborative partnership opportunities with SNFs. SNFRM (SNF 30-day All-Cause Readmission Measure) measures unplanned readmissions to the prior proximal hospital for all Medicare fee-for-service SNF patients within 30 days of discharge. Performance in CY 2017 will be compared to a SNF’s own performance in CY 2015 and to the national mean of the best decile in CY 2015 which is 16.399%. Facilities nationally will be ranked on performance. Going forward, the SNFRM will be based on data for 12 months of SNF admissions, and as such will be evaluated on a 1-year cycle. Data source: This measure is drawn from data in the Medicare eligibility files and inpatient claims data. The baseline readmission rate for CY 2015 will be released by CMS sometime in summer 2017. Overall 5 Star Rating, overall Quality Measures rating, and census. This is especially pertinent for those SNFs participating in alternative payment models who may be excluded if they do not maintain 3 Stars or higher. This metric represents the percent of short-stay residents who entered/reentered the nursing home from a hospital and were re-admitted to a hospital for an unplanned inpatient stay or observation stay within 30 days of the start of the nursing home stay. Example: According to healthcare reform initiatives, every PAC provider must avoid readmission at all costs! As a forward-thinking health care solutions organization, HealthPRO®/Heritage can both support and execute on care redesign initiatives to mitigate readmissions, keeping PAC providers ahead of the curve. Likewise, count on HealthPRO®/Heritage to assist with navigating the confusion with new rules, regulations and expectations associated with healthcare reform! For more information, please contact Clinical Strategies at ClinicalStrategies@healthpro-heritage.com.